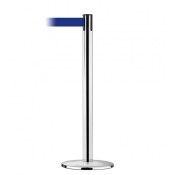 The world wide standard in post and tape pedestrian crowd control systems. Also available in the 890 Standard style. Lifetime limited warranty with a patented SlowRetract tape cassette and 4-way connecting system. Maximum tape length is 7 ft. Post: 38"H; 13.5" Base diameter.